ARLINGTON, VA. -- JANUARY 03, 2018 -- Pittsburgh Public Schools is making college and career planning accessible for all of its 11,500 middle and high school students by implementing Hobsons’ Naviance, the leading solution that helps students prepare for life after high school whether they pursue college, a career, or the military. Pittsburgh joins a growing number of large public school systems across the country, including some of the largest urban districts -- Los Angeles, Calif.; Chicago, Ill.; Houston, Texas; and Broward County, Fla. -- who are embracing Naviance as their district-wide college and career readiness platform. More than one-third of the 300 largest school districts now use Naviance. The implementation of Naviance will help PPS increase graduation and financial aid application rates, as well as accurately track college applications, acceptances, and scholarships. The district also will be better equipped to guide students through the process of identifying their strengths and interests, and exploring careers and colleges to create personalized plans for life beyond high school. District officials will gain the ability to monitor and promote the completion of FAFSA, the federal financial aid application that is a critical step in the college decision process and correlates to higher rates of admissions, attendance, and college completion. Implementation of Naviance will begin with District 8th and 11th graders in February, rolling out to all middle and high school students next Fall. The number of school districts championing comprehensive initiatives to prepare every student for life after high school has increased significantly in the past five years. There has been a 384 percent increase in the number of districts opting for a district-wide implementation across all high schools, and a 308 percent increase in the number of districts opting for district-wide middle school implementations. Incorporating Naviance district-wide not only provides college and career planning accessibility to all students, but also gives districts a comprehensive view of how individual schools are meeting key college and career readiness milestones, in comparison to schools across the district. 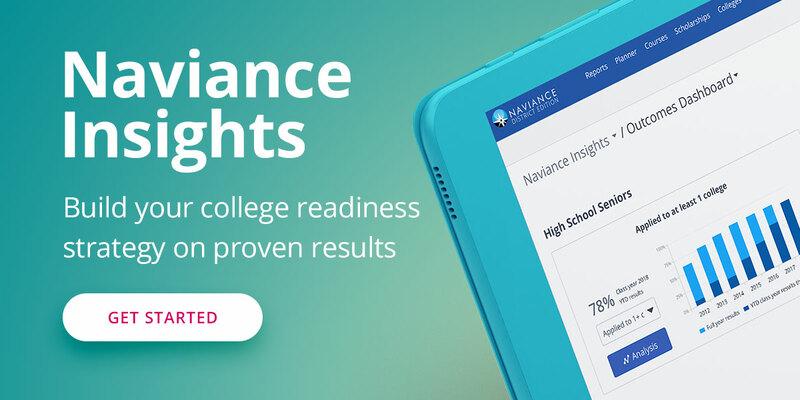 Naviance is the world’s leading college and career readiness platform, used by more than 12,000 schools and districts and millions of students around the globe, including 40 percent of U.S. high school students. Among the large public school districts choosing Naviance are Los Angeles Unified School District, Chicago Public Schools, Philadelphia Public Schools, Cincinnati Public Schools, and Broward County Public Schools. The continued adoption of Naviance demonstrates a growing trend of large school districts using technology to make college and career readiness a priority for their students and their communities. Naviance by Hobsons is the world’s leading college and career readiness platform that helps more than 12,000 K-12 schools and district to align student strengths and interest to postsecondary goals, improving outcomes and launching students on a path to succeed after high school, whether their next step is a 4-year university, 2-year community college, trade school, the military, or directly into the workforce. Naviance is recognized as the 2017 SIIA CODIE Award winner for Best College and Career Readiness Solution. A global leader in education technology, Hobsons helps students to identify their strengths, explore careers, create academic plans, match to best-fit educational opportunities, and reach their education and life goals. More than 12,000 K-12 and higher education institutions partner with Hobsons and leverage our solutions -- Naviance, Intersect, and Starfish -- to improve college and career readiness, college admissions, and higher education analytics and intervention to support millions of students around the world. The Pittsburgh Public School District is the largest of 43 school districts in Allegheny County and second largest in Pennsylvania. The District serves approximately 25,000 students in Pre-Kindergarten through Grade 12. In April 2017, PPS Superintendent, Dr. Anthony Hamlet, unveiled 2017-2022 Strategic Plan: Expect Great Things, aimed at transforming PPS into a student-centered culture built on continuous improvement. Pittsburgh Public Schools offers students a variety of options and opportunities that will help them succeed in school, and prepare them for whatever comes next in college, career and life.